Chattanooga's Sully® Hip S'port features hook sensitive plush material which allows attachment of elastic straps in almost any position. These straps may be attached at any point, in any direciton and with any amount of applied force; this allows the user to functionally stabilize, assist or restrict movement as they see fit. On the inside, comfortable nylon-lined neoprene supports any movement made by the athlete. The Hip S'port is simple to apply and requires no assistance of any kind. The apparatus is comprised of two 5" x 44" straps and a protective, closed-cell foam pad for use with hip pointers or thigh bruises. I have a 13 year old daughter who is a year round soccer player with a hip flexor strain. Would this be helpful? Yes, the Chattanooga Sully Hip S'port is a good brace for hip pain and support. It fits well under athletic shorts. I was diagnosed with a partially torn labrum in my hip will this support help me? Can this be used to play tennis with snapping hip syndrome? are there any instructional videos on how to wrap the bands? The product came with an informational sheet, but I am having a hard time following it. 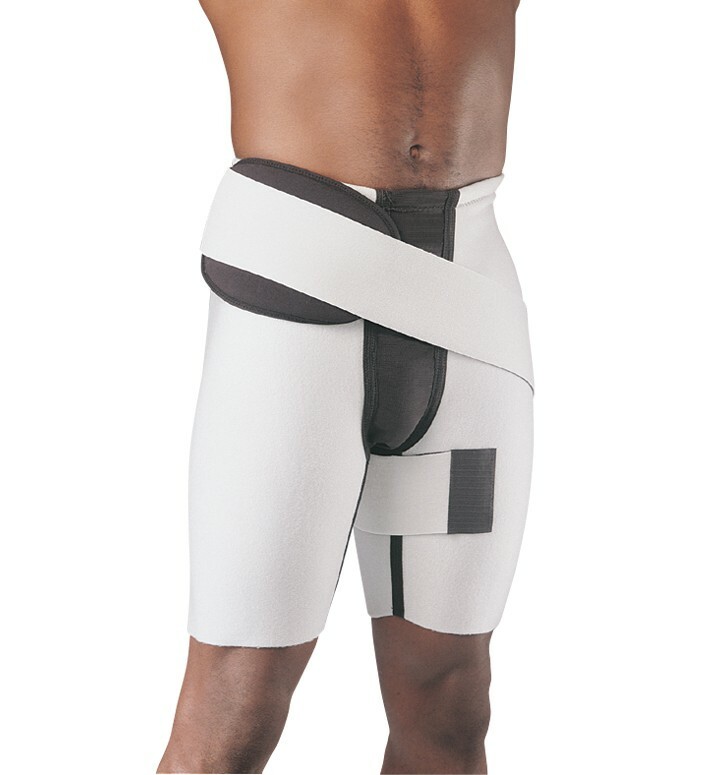 The Sully Hip S'Port will help with muscle strains by providing compression to the area and by using the straps it will help to decrease certain muscle pain with activity. My son is a hockey goalie and he keeps having groin issue will this CHATTANOOGA SULLY HIP S'PORT assist him? If not do you have a product for this issue? Yes I would suggest using this support for your sone. The brace will provide support to the hip and groin area. I have bilateral coxa valga, which means that my hips dislocate easily. Would you recommend these braces? I like the look of the diagonal brace from the hip to the leg. Can it be done for both legs? In the description of the brace it says that it comes with two 5" X 44" straps so you could place one on each leg. Do I have to pull the whole thing down to go to the bathroom or is there a slit to use like under ware? The brace is not specifically used for that but it is possible that it could help by restricint motion which may be causing pain. Can the Chattanooga Sully Hip S'port be used to help with the pain from a Labral tear in the hip? Can this brace be used for back and leg sciatica? My daughter sprained her left hip flexor playing soccer, she is 15 y/o. My question is: Is the Chattanooga Sully Hip S'port the right support for a hip flexor? and, can she wear the support while playing soccer? I have had this brand name brace for about a year. Used every time I played golf. Used until I could not stand the pain on my hip. Had hip replaced six weeks ago and now need a second brace as I will use it every day. Ordering a second brace to use more often. Pros: Held me together on my golf swing really good, especially when I put the two elastic bands. Also used around the house to do yard work. Cons: Only one con-hot and sweaty, but able to tolerate the heat as long as the brace gives me the great support.